My recipe for baked apples is inspired by my friend Bev. She makes these as a quick and easy dessert when she and Eric are in the mood for something sweet. This month, my friend Hila is the host for Meeta’s Monthly Mingle. She challenged us with a Heart Healthy theme and even though this is part of my every day eating, I was not sure what to share with you. Dave and I have eaten a heart healthy diet for many years. I do not want him to die of heart failure or some such ill, and I come from a family where both my parents have high cholesterol. It has not skipped a generation for some time, and my sister suffers from this as well. I however am lucky, and can eat what I want when it comes to fat and butter and all the good things. I look after our hearts by making sure we eat healthy food, we exercise often, and we watch our alcohol intake. What I cannot do, is protect our hearts from sadness. Today my heart is heavy. I woke up to sad news, and this is news I cannot share, so the burden of sadness is mine alone. And worry – I am worried about the person who shared the sad news. I am worried, because there is nothing I can do. My heart is heavy because I fear that the person who is hurt, has been hurt beyond repair. I am sad because they cannot move away from what is hurting them as they are the one inflicting the hurt. I cannot mend the broken heart. The saying “an apple a day keeps the Doctor away” could be the perfect heart mending advert. Apples help reduce heart disease and help with controlling cholesterol. So, where I will have to leave my friend’s heart mending to those that can help, I will share my simple recipe to keep your hearts healthy. I used really small apples, but if you are going to use larger ones, please see Misk Cook’s post for a few more instructions on how to bake them. I hope that your friends heart will be mended in the future. I hope that you don’t have a heavy heart for long and do not dwell on what you can’t change as stress is bad for the heart. I thank you for thinking of all our hearts with your lovely apple recipe. May you and your friend’s heart be lighter in the future. 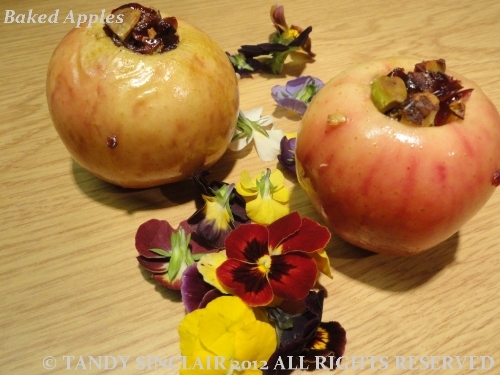 These look delicious – I will try rosewater next time I make baked apples. I’m a bit stuck in a rut as I always stick to raisins and cinnamon. I’m sorry to hear about your friend. Sometimes when we feel we are not able to help though we can help, just by being there for someone and listening. I love baked apples! Thanks for the reminder, and some delicious touches to this recipe! My pleasure, and maybe you can get Felix to stuff the apples? Those look wonderfully delicious! I love lighter desserts. Perfect for during the week when time is scarce! It’s unfortunate that a heavy heart can’t be lightened with good food because if it could, this recipe would be medicinal. I intend to try it this weekend as it will suit my hubby’s diabetes-restricted diet. I have some leftover pecans that I’ll use. Should work okay. I hope. oh, I love how those are stuffed. I imagine that this would be delicious with a little bit of cheddar or stilton alongside. Lovely, I’ve been wanting to use rosewater lately (I never have). I recently saw a post on how to make your own… These look great and I bet they make the house smell awesome! I’m so sorry to hear about your bad news! It’s so awful when you just want to help someone so badly but there’s nothing you can do. food can definitely provide comfort, though, and these baked apples sound like absolutely perfection! It’s hard to stand back and watch and not be able to actually help. And thank you for a lovely simple recipe and I like your addition of roase water too. Rose and apples combine so well and I thought this was a great way to do so 🙂 Thanks for the kind words Claire! I was so sorry to read some of what you are going through. Tough times for you. Thank you for taking the time to share such a lovely recipe – it reminded me of my grandfather who loved baked apples and my mum often used to make them to eat after the Sunday roast. A lovely memory for me. so glad I brought a memory back for you 🙂 Life is not always about the good times, and I love that I can blog about everything here! What a burden on you Tandy, hope all is sorted soon! Your apples look lovely – at first glance I thought they were pomegranates. I agree and apple is really good for lots of things.